Orillia Volkswagen invites you to join us at our next New Owner Service Clinic. 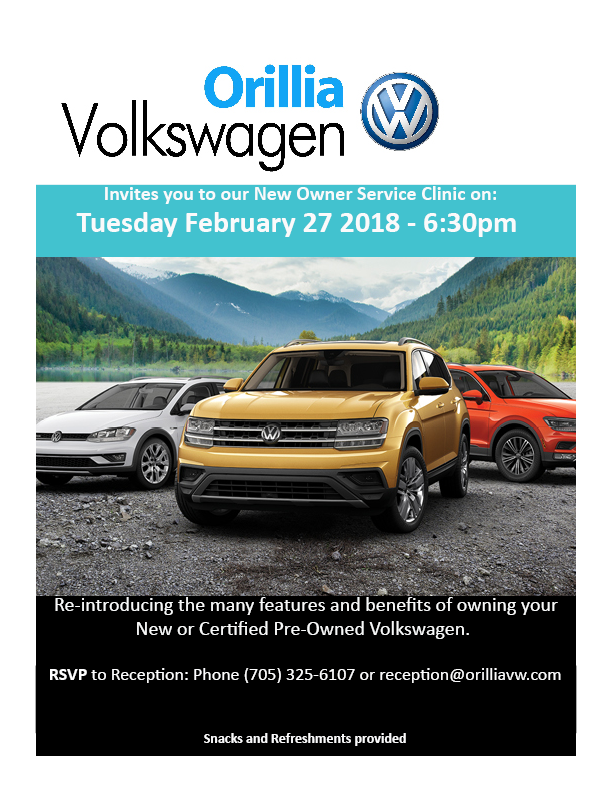 Our next clinic will be on Tuesday, February 27th, 2018 @ 6:30 pm to welcome those who have recently purchased a new or pre-owned Volkswagen. The clinic is an opportunity for new customers to feel comfortable in all areas of the dealership. Our clinic will inform you about many different aspects of your vehicle ownership. You will learn more about your vehicle and have an opportunity to ask questions. Some of the things you will learn about your vehicle are manufacturer’s service requirements, special features, and safety systems.